The main spirit walking through the streets. A dozen drummers lead the crowd through the dusty streets of Ouidah, Benin. I follow the repetitive rhythm, past tree branches where kings hung human skulls, alongside shrines stinking of gin, into narrow alleys of brightly painted doors. 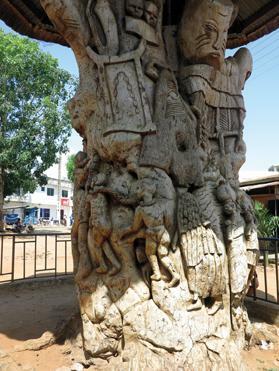 A tree of slaves’ souls in Ouidah. Villagers keep joining the procession. There’s now a few hundred gathered together, all waiting for a spirit to appear for the first time in seven years. Drums stop, women scream, children run and a figure appears. It’s clearly a man in a costume but the spooky resonance also has me running, convinced that white magic is at work. 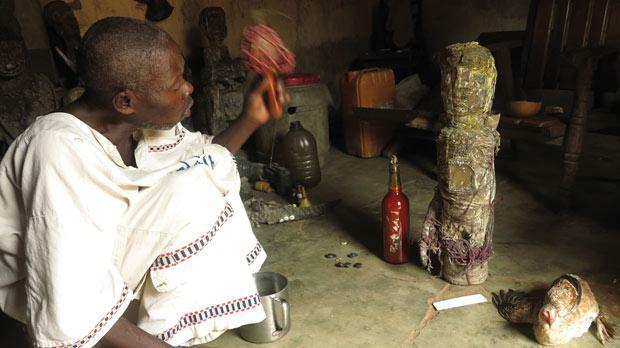 Benin is the birthplace of voodoo culture and the majority of this small West African nation still believes in it. Voodoo is the national religion and ceremonies like the one I’m witnessing take place all over the country, on an almost daily basis. The spirit’s cape is laced with sequins, his face hides behind a red and black striped mask and his shoes twinkle resplendently. He walks. Everyone follows. Intermittently the spirit falls into a trance, wildly waving the cape like an indefatigable matador. Local custom dictates that anyone who touches the spirit will die. So when the cape spins, the crowd scatters in pandemonium. Monkey skulls at the fetish market. This spirit hasn’t been seen for seven years and he’s due to meet all his other fellow spirits at an unknown meeting point. With the harvest season imminent, it’s a ceremony bestowing good luck for the village. He marches my way, pointing at the camera and extending a hand. All spirits must be placated and there’s two things they love more than anything: alcohol and money. I fumble for notes and coins until he’s satisfied. Despite meeting with local voodoo chiefs to obtain permission for attending the ceremony, handing over cash is to become a feature of the day. Now a fight breaks out. The spirit has spun into a hotel gate and the security guard has held him back. Villagers throw fists and insults, disgusted that anyone would dare interrupt such a sacred being. We wander aimlessly, the spirit constantly changing direction for more than two hours until we approach a clearing in the forest. Gin is drunk, more drummers arrive and here comes a pantheon. One spirit has a masked face like an elephant. Two horns hang proud on another’s cape. Another costume is constructed from multicoloured fabric strips, and one makes me think of a clichéd troll. Spirits whisper together before charging at the crowd. Now it’s scary. There’s too many to keep track of and I’m lost in the paradigm, certain that death will come should I meet their touch. For hours this plays out, drumming, gin, spirits consulting. Then they all head into the forest and only the voodoo chiefs are allowed to follow. 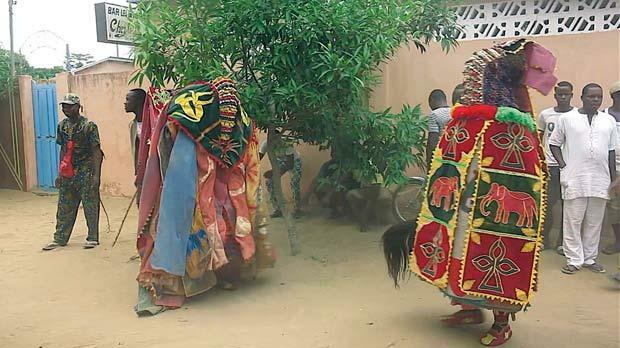 The voodoo doctor performing a ceremony in Abomey, with a deity, on right, covered in chicken blood and gin. It sounds ridiculous. These are clearly men in costumes. Yet the whole atmosphere epitomises Benin. The country makes the surreal instantly believable by steadfastly maintaining a dedication to tradition. 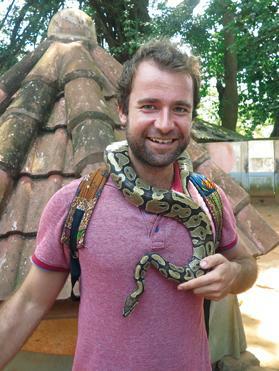 Next I’m in the Python Temple, great snakes wrapped around my neck as prayers are whispered through incense smoke. I also purse my lips to utter a divine greeting, although that might be because three other pythons have started to wind around my leg. Running from the town to the coast is a slave trail, poignant evidence of the tens of millions that were exported out of Ouidah. Many went to Haiti and took voodoo to the Caribbean. Many more got sent to South America long after slavery was outlawed. My guide explains further. Some slaves were slaughtered before they left, supposedly to provide souls that would appease the gods. Making friends in the Python Temple. Below, two spirits meeting. This land flourished during the 17th and 18th centuries, the Dahomey Kingdom made rich by swapping slaves for weapons, and then using gunpowder to massacre neighbouring tribes. I travel to the kingdom’s historic heart, Abomey, one of 12 passengers in a five-seater taxi. We squash together for eight hours, travelling on mud roads through lush jungle, one passenger vomiting on the legs of three others. Fortunately I’ve got the shotgun front passenger seat, which means I only need to share the space with one other passenger. The relics of ancient mud palaces cover Abomey. A few walls and towers remain intact, the distinct colour making them look like extensions of the dusty earth. These palaces are now a Unesco World Heritage site, although preservation has meant that the best palace walls are now hidden behind a protective layer of concrete, something I struggle to understand. Each king built a new palace and the stories are startling. Hundreds of slaves were beheaded during ceremonies to celebrate everything from new sons to war victories. When a king died, scores of women would sacrifice themselves to be buried with him. Death, it seems, is an omnipresent narrative. Yet despite this gruesome and brutal past, Benin comes across as a welcoming and peaceful nation, far more so than other countries I’ve seen in West Africa. Despite the language barrier (French versus English), there’s an atmosphere that evokes the endearing sociability of the continent. Even in the dingiest of roadside stalls I’m welcomed with a bonjour and freshly baked baguette. And it’s one of these darkened saloons where the next encounter with voodoo begins. Over mugs of thick coffee, a man with a motorbike agrees to take me to some local villages. The first stop is a fetish market. Animal skulls line wicker baskets: baboon, crocodile, kudu, horse. 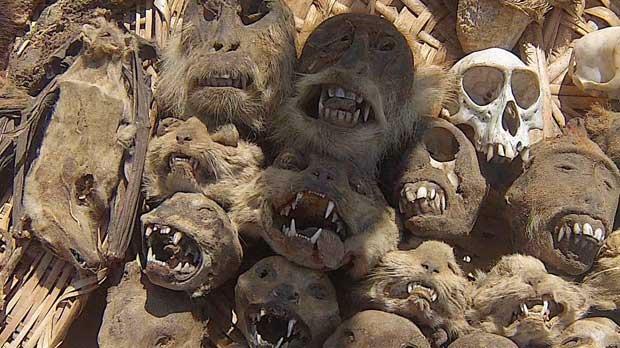 The stench of death wafts around, mingling with the leather and animal skins, the scorched bones and the dried spices. A young boy whisks me into a consultation room. A witch doctor says prayers and asks questions I don’t understand, indicating my chesty cough in a room stinking of decayed animals. A potion is prescribed: half a monkey skull, two seahorses, a cow tail and several other less interesting things. To cure an asthmatic with lungs agitated by dust, simply buy everything on the list, grind it up, drink some of it and bathe in the rest. I decide to stick with my inhaler. In a tiny village we see another voodoo doctor, a crazed man pouring gin over statued deities. He chants and chatters, taking the odd shot as he shakes a maraca and entices the spirits. My friend’s mother is terminally ill with cancer and the voodoo man wants to help. As the doctor chants away, her name is written down and stuffed onto a wooden statue. Palm wine is poured into a calabash and a chicken appears. Rather uncomfortably, I must relay my message to the gods by speaking to the chicken, a chicken that squirms in an attempt to prevent fate. A razor blade slices, a throat is split and the chicken’s blood merges with palm wine. Pouring the concoction over the deities, the voodoo doctor requests that somebody thousands of miles away will be saved from death’s clutches. Three weeks later, I find that he’s been unsuccessful. Despite the proof of voodoo not working, Benin compels me to take it seriously. Beliefs are far more believable when everyone believes in them ­– and that is this country’s greatest appeal. 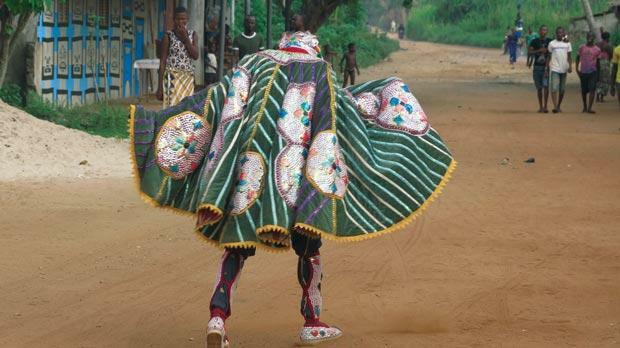 Benin doesn’t offer the opportunity to explore a historic tradition laced with intrigue. It provides an experience of being immersed in a weird yet wonderful culture that remains virtually unchanged for centuries. While the clothes may have changed and the buildings transformed from mud to brick, Benin is a version of old-world Africa that lingers long in the memory.